It’s only been about a month since their visual novel demo To The Edge of the Sky was released, but Aeon Dream Studios has already achieved great success with a 4.9/5 user rating on Google Play and over a hundred thousand installs. With beautiful graphics and an intriguing storyline set in 2077 featuring BTS members as characters in an enigmatic government organisation, the demo has definitely whetted the appetites of fans who cannot wait for more. We spoke to the game’s creators at Aeon Dream Studios about their new game as well as their future plans and dreams. 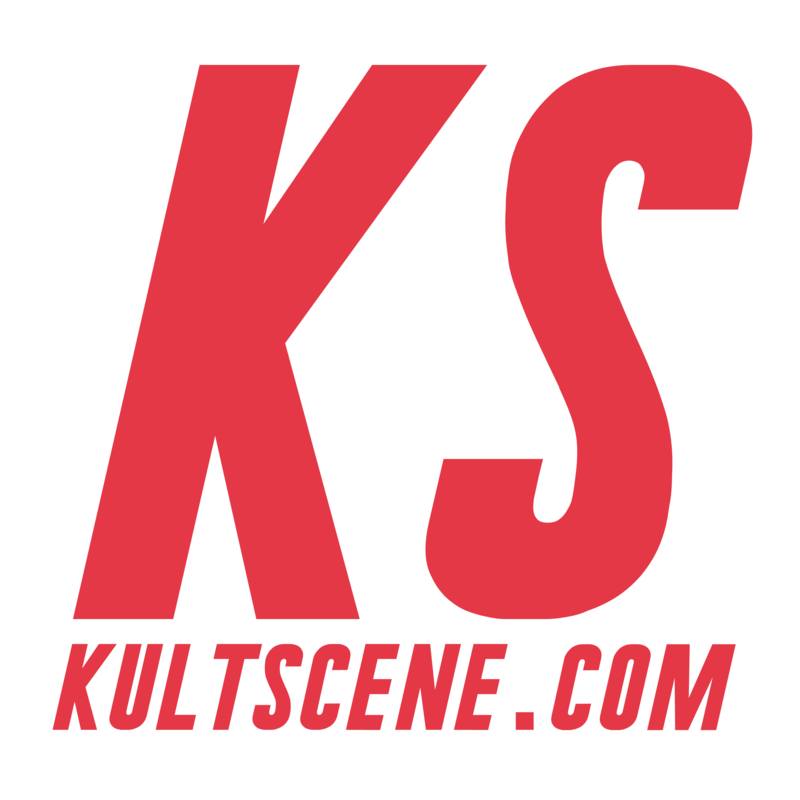 Kultscene: Thank you for taking the time to talk to Kultscene. To begin with, could you all introduce yourselves and your roles in the company? Ajané Celestin: Hello! I’m Ajané Celestin. I’m the CEO, Creative Director, and I also write and act as the Editor. Chieu Nguyen: I’m Chieu Nguyen. I’m the Art Director and Lead Artist responsible for most of the visuals in our games, mainly character art and user interface. Eglė Dilytė: I’m Eglė Dilytė. I’m the Lead Creative Writer, main scriptwriter, and I also work as our Social Media Coordinator. How and why did you decide to found this company? AC: Chieu, Egle and I met up on Tumblr as fans of visual novel games. We became friendly with each other and since Egle and I were writers and Chieu was an artist, I asked them if they wanted to make a game. We decided to see what would happen and go as far as we could go. We didn’t imagine things would get this far, but we’re very happy it has. What first inspired you to create To the Edge of the Sky, and more specifically, to model your main characters after the BTS members? AC: We’re fans of BTS’ music and their concepts and aesthetics constantly inspired us last year. 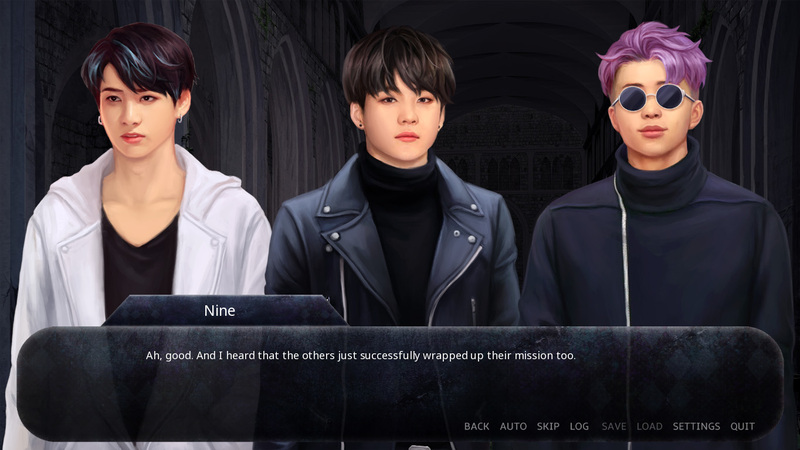 As creators, we began to see more ways we could flesh out some of their story concepts in a visual novel game format and also thought that ARMYs would probably be interested in such a game. What were the challenges you faced in your creation of To the Edge of the Sky? CN: Definitely time pressure. We had about two weeks for this demo while still planning on our previous game, so it was rough trying to get the assets done while still maintaining our usual quality. Fortunately, the first part of the demo was finished like how we envisioned it. AC: As Chieu said, it was mainly time. Chieu had already done promotional artwork because we were gearing up to create the demo, but I suddenly came up with the idea to do it before I headed to their Newark concerts in March so we could hand out the promotional artwork. We challenged ourselves to create a concept from scratch as well as artwork within roughly a 10 day period. However we were able to achieve it and are grateful to receive the positive responses. You’ve posted online about your plans to present the idea for To the Edge of the Sky to BTS’ label, BigHit Entertainment, how do you intend to achieve that? AC: As anyone who has been paying attention to BTS knows, they are reaching their peak right about now, so it is very difficult to contact them. Right now we are in contact with someone local to Seoul who may be able to assist us with that further. 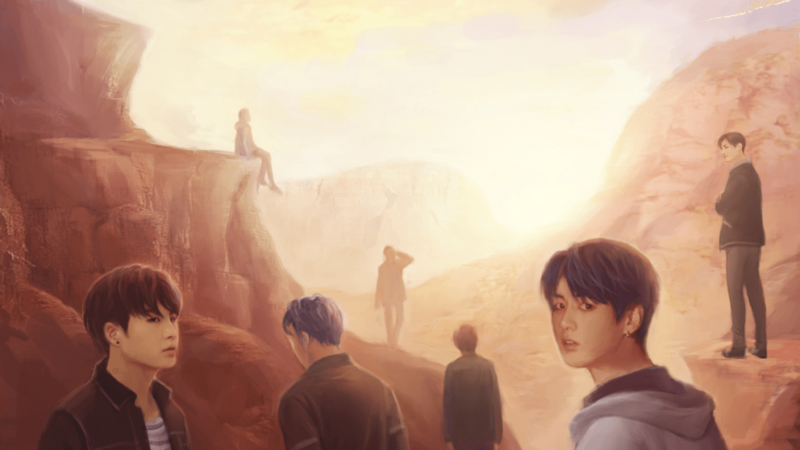 To the Edge of the Sky has become very popular on the Internet, especially among ARMYs (BTS’ fandom). What would you like to say to the new fans of your game? ED: Well, first of all, hello and welcome! Thank you for playing our demo and thank you so much for your kind words and support. This might sound a little cheesy, but we feel energized by all the love and we’ll continue to work hard for everyone. AC: I’d like to say that we’re really, truly grateful for all the kind and positive comments we’ve received. We had no idea To the Edge of the Sky would be so well received. We put everything we had into it during the short time we had and are so grateful for the ARMYs that gave us positive responses at the Newark concerts and through social media and emails. We can hardly believe it but To the Edge of the Sky is nearing 400,000 downloads within two months of its release and we’re really grateful for the thousands of positive reviews so far. Thank you for also becoming fans of the game and we promise we will do our best to develop this game for you. CN: Thank you so much for your generous support thus far, it means a lot to us. We will continue to work hard and hope that you could see this game come to fruition with us. So far only a demo for To the Edge of the Sky has been released, what will come next following this release? AC: After we finish our current project, we are planning to work on developing the next part of To the Edge of the Sky. We want to give ARMYs more while we continue to work on making this a full game. ED: With a much larger games library and still creating more, it’s been my wish and I think all of ours really to be able to work together and create together until we die of old age. And I hope we’ll be able to produce more content than just visual novels. CN: We would have more games out with higher quality, and it would also be nice to have a larger fanbase. We are never satisfied with the status quo and are always seeking to improve the quality of our work. Therefore, it is my hope that in 5 years time, we will create even better games and be able to reach out to a wider range of audience. AC: In five years…It’d be really nice if we had a few different series. It’d be really nice if we could produce more games like To the Edge of the Sky, where genres are crossed over, as well as our own, completely original work. I want us to continue to become better developers, writers and artists and make a variety of different games for all kinds of people. It would be interesting to do work outside of games as well, under our brand name. Check out Aeon Dream Studios and their current works here! Have you tried out To The Edge of the Sky? Are you a fan? Tell us what you think in the comment section below and be sure to subscribe to the site and follow us on Facebook, Twitter, Instagram, and Tumblr to keep up with all of our posts.